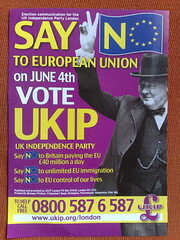 UKIP election propaganda by mia!, on Flickr. Twelve and a half years ago, I was still living in Denmark when I got an attractive job offer from a company in Bishopbriggs, and the EU made it easy to accept the job — I didn’t need to apply for anything in advance, and after I started my job, I could simply get a national insurance number and other necessities. By far the hardest bit was getting a bank account, and it took me two years to get a credit card, but the public-sector paperwork was minimal and straightforward. As EU citizens in Scotland, we are treated as normal members of society. We cannot vote in Westminster elections and UK-wide referendums, but otherwise there’s not really anything we cannot do. We can even vote in the independence referendum, which surely is the ultimate sign that Scotland accepts us as New Scots. Compared with Denmark, which is a very homogenous country without a strong tradition of emigration, Scotland has always been a multilingual, multicultural and multireligious melting pot, and emigration and immigration are simply facts of life here. The result is a very tolerant society that is welcoming to people who want to make Scotland their home. In this regard, Scotland seems very different from large parts of England (I don’t know Wales and Northern Ireland well enough to comment on them). Of course there are many wonderful tolerant people there, too, but UKIP is clearly very attractive to many voters there, and that scares me witless. UKIP reminds me in many ways of the Danish party called Dansk Folkeparti, not least because both parties are very successful in planting xenophobic seeds in the minds of their political opponents so that the entire country shifts decisively towards unpleasantness. However, there is one big difference between Dansk Folkeparti and UKIP: the former is strongly anti-Muslim, while the latter hates the EU more than anything, and they clearly aren’t friends of EU migrants. This means that the UK is likely to get tougher and tougher on us. Even if the country remains in the EU, UKIP’s influence is likely to make it harder and harder for us to access the NHS, get unemployment benefit if we lose our jobs, or be reunified with family members. Of course, if the UK actually votes to leave the EU (and we won’t have a vote in that referendum, of course), all hell will break loose. The consequences don’t even bear thinking about. Because of this, voting Yes is a no-brainer for EU citizens in Scotland. Even if an independent Scotland was forced to leave the EU (and most experts agree that’s extremely unlikely, e.g., Yves Gounin, John Palmer and others), Scotland’s tolerance and acceptance of us means a solution would be found to allow us to continue to live here. I understand if some EU citizens in Scotland occasionally feel worried about an independent Scotland’s continued EU membership, but that’s really not the danger to our future. Scots don’t want to get rid of us, and we’ll be allowed to remain here as New Scots, even if Scotland ends up an EFTA member like Norway. The real danger to us is living in a country led by a Westminster bubble where everybody is dancing to UKIP’s tune. We must vote Yes to protect our future. ← Dinna fash yersel — Scotland will dae juist fine! I don’t think it’s necessarily correct to equate dislike of the EU with xenophobia. It’s more about a difference in political culture between mainland Europe and England. England’s political instincts by and large through history have tended towards small-state-individual-freedom, particularly since the 1689 ‘revolution’, whereas continental politics have long tended in the opposite direction, particularly since the 1848 political earthquakes. Post-1945, the UK went in the Statist direction, but the popularity of Margaret Thatcher in England when she brought that consensus to an end was a sign that a regression to the liberal mean was both necessary and desired (and desirable). Also, remember that the creation of the European Coal and Steel Community, the seed from which the EU grew, was to solve a problem that wasn’t of England’s making: enmity between France and Germany. The growth of the ECSC into what we have today was driven by a desire to unite continental Europe to prevent war. England at no point caused the two wars in Europe … this was a solution to a problem that England was not a part of. I have misgivings about the political structure of the EU. That doesn’t make me xenophobic (you know that!). I very much agree with much of what Daniel Hannan writes on the EU: one reason is because he understands English political instincts so well. I also understand why Danes would be attracted to the Folksparti in the face of Muslim immigration. Danish culture is very liberal and tolerant, and equality is important to Danes. The same can’t be said of Muslim culture. Rob, of course I know you’re not xenophobic, and thanks for trying to explain English political culture. However, even though there are principled Eurosceptics who genuinely only dislike the EU construction, not their fellow Europeans, the scaremongering that is now taking place in the tabloid newspapers about EU immigration and the inability to stop it without leaving the EU surely has a strong xenophobic element. Oh, and while Danish culture might have been liberal and tolerant in the ’80s, these days it’s getting increasingly illiberal, intolerant and moralistic.